There is a PDF version of this document for downloading and printing. North Carolina, home to over 100 wineries, ranks fourth nationwide as a wine tourism destination (NC Department of Commerce, 2012). Recently, NC wineries located near each other have been forming wine trails to strengthen their tourism appeal and increase visitors’ numbers and expenditures. The development of wine trails is also important to foster cohesive and harmonious communities (Briedenhann & Wickens, 2004). The Piedmont Triad in north central North Carolina is fast developing a wine industry; as of 2015, the Triad has more than 30 wineries arranged in 11 wine trails (Figure 1). However, due to such fast development, we are yet to know the nature of the relationships between these wineries and their neighbors. 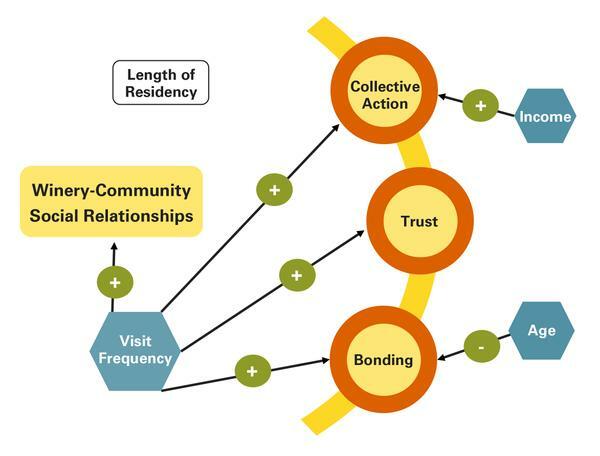 Understanding these relationships is important to foster community bonding as well as socioeconomic and civic benefits in surrounding communities (Meyer-Cech, 2005). 1 The sample included 401 households around the Haw River and 262 around the Surry County. The survey, distributed using a drop-off/pick-up method, inquired about residents’ sociodemographic characteristics, their relationship with the Triad region, and their perceptions of different types of relationships with local wineries. 2 A combination of statistical tests was used for data analysis (p-value <.05): Descriptive statistics to profile respondents, Cronbach’s reliability tests within the items comprising the social dimensions, and multivariate regressions to examine associations between residents’ profile indicators and their perceptions of the winery-community social relationships. Figure 1. Wine trails of the North Carolina Piedmont Triad. Slightly more women (58%) than men (42%) responded to the survey; respondents averaged 52 years old. Although 51% reported an annual household income above $50,000, 20% earned below $25,000—which is consistent with the 24% who hold only a high school diploma and the 32% retired. Respondents were strongly rooted in the Triad; on average they lived 38 years in the region and 22 years in their current neighborhood (Figure 2). Figure 2. Years of residency in the Triad. Overall, few respondents visited the Triad wine trails in the last three years (Figure 3). Only 12% were frequent visitors, 19% visited wineries rarely, and 17% occasionally; most (52%) have never visited any Triad wine trails in the last three years. Given the study location, it is not surprising that the Surry County (26%) and Haw River (20%) trails were the two most visited wine trails of the Triad. Figure 3. Residents' visitation to Triad wine trails (last three years). Over one-quarter (28%) of respondents were unable to rate the relationship between the Triad wineries and their surrounding communities. The remaining respondents felt that the relationship is good or excellent (62%); 23% rated it as average, and only 15% as fair or poor. In more detail (see Box 1), residents believed that Triad wineries and local communities can work together (Collective Action) and neutrally rated how much they trust local wineries (Trust). However, residents did not consider wineries as part of their lifestyle (Bonding). The older the respondent, the less they felt that local wineries are part of their daily lives (Bonding). The higher their household income, the more they believed wineries and communities can work together towards community goals (Collective Action). The length of residency in the Triad did not influence how residents feel about the winery-community social relationship. 3 Multivariate regressions yielded four significant models (p < .05): Overall winery-community social relationship (R2 = .210, p < .001), Collective Action (R2 = .115, p < .001), Trust (R2 = .068, p = .003), and Bonding (R2 = .285, p < .001). Figure 4. Factors influencing how residents feel about winery-community social relationships. Results showed that wineries should increase their marketing efforts to reach residents and capture them as clients. Although most residents know where to find (52%) and can easily find (56%) information about local winery-related events, only 31% reported having attended events co-hosted by local wineries (Figure 5). Figure 5. Perceived marketing effectiveness among residents. The North Carolina Piedmont Triad is a young but fast-growing wine region that, along with its natural beauty, has the capacity to become a strong wine tourism destination. However, to build a positive social environment with welcoming communities, wineries need to establish strong relationships with local residents. Our study showed that Triad residents perceived a somewhat positive social relationship with their nearby wineries, but there is room for improvement. Residents were uncertain whether wineries make decisions aimed at benefiting local communities, but this perception can be improved as most respondents felt that wineries and residents can work together towards common goals. Results also suggest that Triad wineries should encourage residents to visit them so as wineries become part of residents’ social space and lifestyle. High visitation not only increases locals’ appreciation of the winery-community relationships; it can also help to expand wineries’ local market share. Wineries can increase visitation and market share by strengthening their marketing efforts in the surrounding communities as a whole, as results showed that sociodemographic indicators have a weak effect on residents’ perceptions. Given that trails can help build harmonious communities, we suggest that wineries within trails orchestrate their marketing efforts to reach the local clientele. Since residents are aware of and have access to information about local wineries, we suggest that managers develop price incentives (such as purchase discounts and courtesy wine-tasting tickets) or special events (such as residents’ appreciation wine-tastings) to attract residents to their premises. Briedenhann, J. and E. Wickens. (2004). Tourism routes as a tool for the economic development of rural areas: Vibrant hope or impossible dream? Tourism Management, 25(1), 71–79. Meyer-Cech, K. (2005). Regional cooperation in rural theme trails. In D.R. Hall, I. Kirkpatrick, and M. Mitchel (Eds. ), Rural Tourism and Sustainable Business (pp. 137–148). Clevedon, UK: Channel View Publications. NC Department of Commerce. (2012). North Carolina Wine and Grape Growers Council Annual Report. Raleigh (NC): NC Department of Commerce [accessed 2016 Mar 7]. Xu, S., Y-F. Leung, and C. Barbieri. (2016). 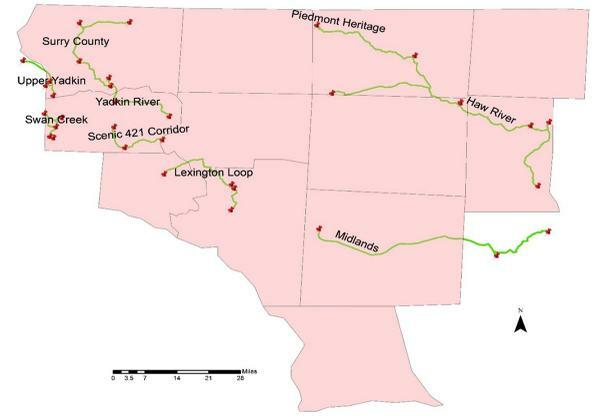 Characterizing themed touring routes—A geospatial and tourism evaluation of wine trails. Tourism Planning & Development, 13(2), 168-184. We wish to thank the following reviewers of this publication: Dr. Carol Kline (Associate Professor, Appalachian State University); Annie Baggett, MBA (Agritourism Marketing Specialist, NC Department of Agriculture & Consumer Services); and Jennifer Hiatt (Manager) and Neil Shore (Owner) from Sanders Ridge Winery.